Hey, Jeanne Gang won the MacArthur genius grant! 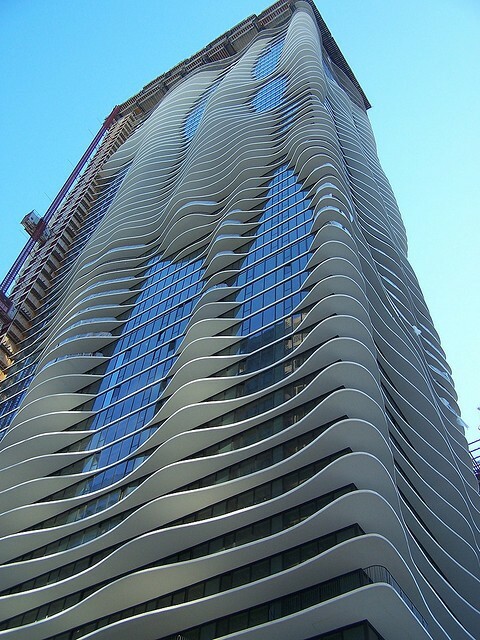 The local architect—who the MacArthur citation says is "challenging the aesthetic and technical possibilities of the art form in a wide range of structures"—is best known for Aqua, an undulating downtown structure whose look resembles water. In the Reader in 2006, Lynn Becker described the proposed tower as signifying "a new kind of Chicago architecture"; read his full review here, and see some specific notes on the tower's design after the jump. Gang wanted to celebrate the verticality of her 822-foot building, but she didn't want it to be revivalist. So she first examined the way tall buildings relate to their surroundings. Most new designs, she points out, are presented as idealized drawings that leave out everything that's around a building and place viewers in a spot where they can take in the whole thing in a single glance, even though the actual streetscape makes that impossible. (Loewenberg's marketers are selling Aqua the same way.) "The real way you experience buildings in the city," she says, "is in the oblique view—looking up or looking down at it from another tower." More important was the perspective from inside the building. Developers want views, and Gang intended to offer as many compelling ones as possible. "Views are easy to get from the top," she says. "But from the lower and middle floors you look between this dense forest of high-rises." The Studio/Gang team constructed a supersize model of that dense forest, then used lengths of string to plot the endpoints of the views from Aqua's units. Gang discovered that by adding terraces that swept in and out along the perimeter of the tower, she could create views that wouldn't exist in a rectangular building. Where one terrace bumped outward you suddenly could see Millennium Park's Bean pop out past the edge of the Aon Center. Other terraces created views of Michigan Avenue, the lake, or Frank Gehry's winding BP bridge. Aqua, says Gang, "starts with these really strong connections to the different points of view in the city." And 80 percent of the units—some part of a hotel, the rest rental apartments or condos—will have terraces. After deciding where to put all the bumps, Gang's team studied how the sun would hit each apartment so they could determine the size and shape the terraces would have to be to also provide adequate shade. So they not only curve in and out along the edges of the floor plates, but each one is slightly smaller or larger—up to 18 feet deep—than the ones immediately above and below it, creating swells and valleys along the facades. These waves of concrete neither conceal nor deny the tower's verticality—they sculpt it. There are no Miesian verticals marching in lockstep from bottom to top and none of the ornamental bric-a-brac postmodernists appropriated to cut their towers' height into so many chunks of layer cake. Aqua is something new: the facade as terrain, the skyscraper as a soaring outcropping worthy of Monument Valley.